Have a trusted and reliable company provide your asbestos clearance certificates. Greenlight work with removalists, demolition and refurbishment contractors throughout Melbourne. Licensed asbestos assessors, air monitoring and urgent sample testing on demand. Greenlight are a trusted provider of asbestos clearance certificates for removalists, demolition and refurbishment companies and businesses throughout Melbourne. If asbestos removal is something that happens regularly for your projects, then you need a reliable supplier of independent asbestos clearance inspections with high quality and legally compliant reporting. Greenlight also offer control and clearance asbestos air monitoring for low-cost package rates. Many companies provide single page, non-compliant asbestos clearance certificates that will not hold up to legal scrutiny or to the standards required of an occupational hygiene investigation. Make sure your inspection is carried out by a trained, qualified and licensed professional - call us today on 03 9048 4411. Thank you for your enquiry. One of our consultants will be in touch soon to confirm a booking with you. An asbestos clearance certificate is legally required and will avoid issues like this: residual asbestos materials on the nails and at the edges the ceiling. When is an Asbestos Clearance Certificate Required? Who Can Issue an Asbestos Clearance Certificate? An asbestos clearance certificate is a document that details an independent clearance inspection following asbestos removal works. The inspection is 'independent' in that it must be carried out by a company with no contractual or financial relationship with the asbestos removalist company. For friable asbestos removals, the clearance inspection must include air monitoring within the removal area prior to a clearance certificate being issued. As part of a development application as may be required by your local council. This must also be preceded by an asbestos survey for the building and may require the removal of asbestos materials that will be disturbed by your planned works. An asbestos removalist prepares for works with wrapping material and wearing PPE. The area is cordoned off with warning tape and asbestos air monitors placed at the boundary to removal works. This kind of monitoring provides reassurance to neighbouring areas that the works were carried out safely. Has been issued with an asbestos assessors license by one of the states (note: currently Victoria does not issue asbestos assessors licenses, however all other states do). If the inspector has been issued with a license, then their competence has been independently vetted by Work Safe based on a review of their past work and qualifications. The asbestos clearance certificate should clearly state the qualifications of the inspector towards the front of the document. If this is not stated, the person may not be regarded as competent and the document itself is non-compliant. Quality control on your works maintained - particularly over time working and speaking with your removalists : we focus on effective communication with workers so that the standard needed is achieved and maintained. A professional on site occupational hygiene presence: if there are stakeholders that need to be communicated with or reassured such as neighbouring properties and businesses, Greenlight are a professional presence adding confidence to others of the safety of works carried out. Contol Mark-Up for an asbestos removal site. The red area shows the asbestos removal area, the blue area shows the exclusion zone. 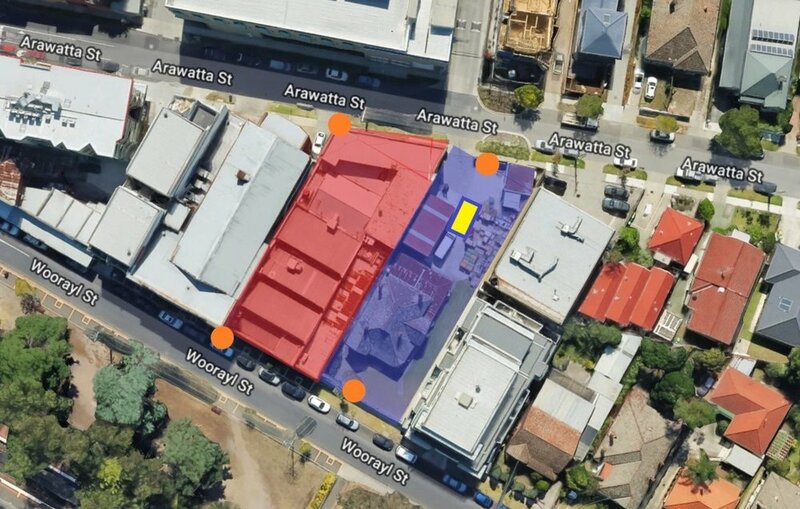 The orange dots show asbestos air monitoring locations and the yellow box is the location of the removal vehicle. Mark-ups like these can be provided in your asbestos clearance certificate on request. If needed, Greenlight can also carry out control or clearance air monitoring with samples analysed in a NATA accredited laboratory. For our regular clients we have industry competitive rates. Greenlight can also provide Division 6 Asbestos Audits and we have a 24-hour asbestos testing service available with couriers provided or samples collected as needed. Regional Victorian projects are covered by our comprehensive service. Make a Booking or call us on 03 9048 4411 and book in your asbestos clearance certificate in Melbourne or Victoria today.